I love my slow cooker. Being able to fill it with ingredients in the morning before work and then coming home to a finished meal after work keeps me sane! I don't always love the way the meals look when they come out of the slow cooker though. Delicious yes, but beautiful? Not always. And a little crunchy texture? Forget about it. 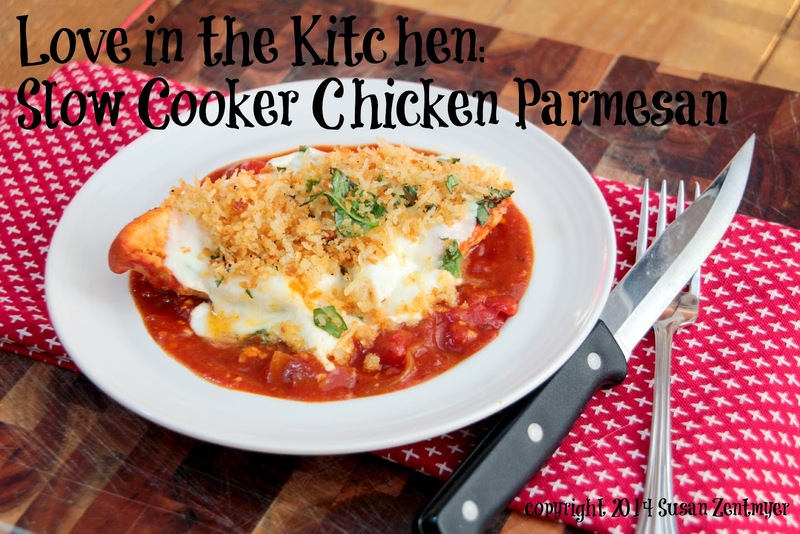 I set out to find a way to have my slow cooker ease AND a beautiful dish. 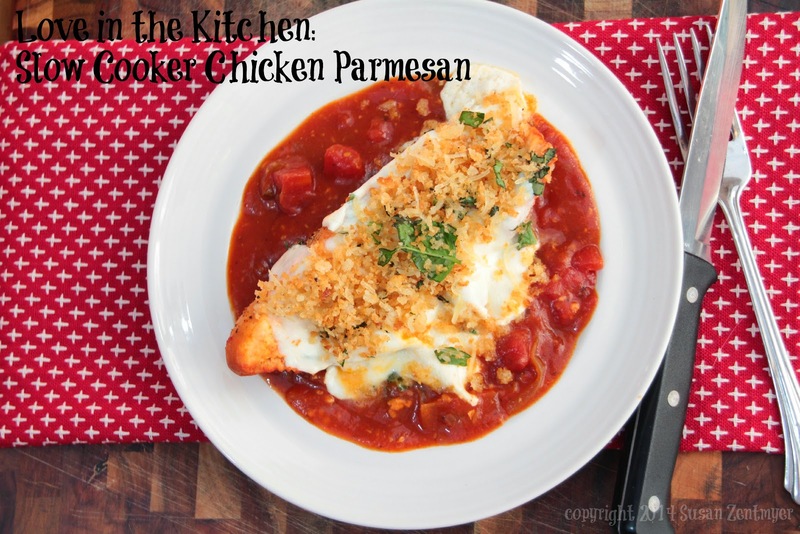 This chicken parmesan was a perfect choice. Chicken done in the slow cooker often comes out falling apart - because we often cook it too long. I cooked this only until it was done, just a little over 3 hours. I also started with a thick, almost paste-like sauce because chicken gives off a lot of moisture when it cooks and makes the sauce soupy. Then, at the end, I added the cheese, which melted while I make a crispy herbed bread crumb topping. This was a fantastic meal. The best compliment of the evening: when I served this to my mother-in-law, she said "I thought you said you made dinner in the crock pot" Recipe WIN! 1. Season chicken with salt and pepper. Heat 1 tablespoon oil in 12-inch nonstick skillet over medium-high heat until shimmering. Add onion, tomato paste, garlic, dried basil, dried oregano, pepper flakes, 1/4 teaspoon salt, and 1/4 teaspoon pepper and cook until onions are softened and tomato paste is rust-colored, about 4 minutes. 2. Transfer tomato paste mixture to slow cooker and stir in tomatoes. Dissolve cornstarch in water and stir into tomato mixture. Shingle breasts on top of tomato mixture with tapered ends pointing toward control panel. Cover and cook until chicken registers 160 degrees, 3 to 4 hours on low. 3. 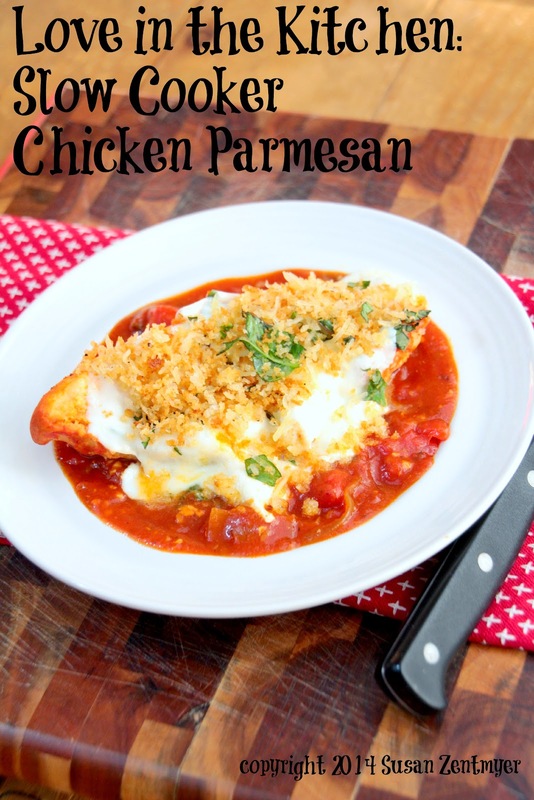 Combine mozzarella and 2 tablespoons Parmesan in bowl. 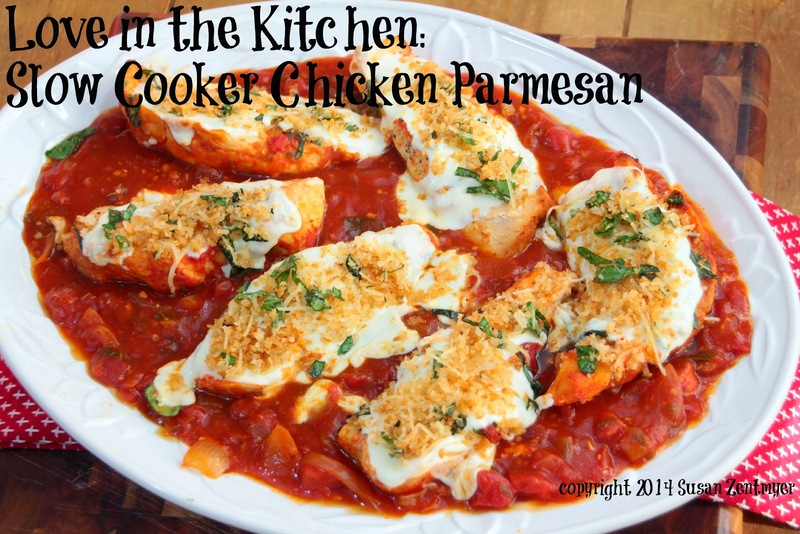 Sprinkle chicken with 2 tablespoons fresh basil, followed by mozzarella mixture. Cover and let sit in turned-off cooker until cheese is melted, about 15 minutes. 4. Meanwhile, combine panko and remaining 2 teaspoons oil in 12-inch nonstick skillet over medium heat and cook, stirring often, until well browned, 3 to 5 minutes. Transfer panko to bowl, let cool for 5 minutes, then stir in remaining 2 tablespoons Parmesan, remaining 2 tablespoons fresh basil, 1/2 teaspoon salt, and 1/2 teaspoon pepper. Sprinkle panko mixture over cheese. Serve. That does look real good!! and a nice compliment is always welcome. Coming over to say hi from the Yuck Stops Here party! These chicken breasts look incredible!